Mini Ring Box Rustic Wood - Personalized Ring Bearer Box- Rustic Wedding Ring Holder- Best Man Ring Box This listing is for a unique rectangular wood ring box with wood slice top cover that has been dried and sanded smooth, with brown felt on the inside, featuring a custom engraving of your choice or design. (See the Personalization Section below). Some wood species we may use are: American Chestnut Black Walnut Black Cherry Maple *rings not included =) Dimensions (approximate) Rectangular 1.5in. X 1.7in. X 1.5in. high. (3.8cm x 4.3cm x 3.8cm high) The diameter of the hole is approximately 1.125inches or 2.8cm diameter. The depth is approx. 0.75in. or 1.9cm deep. *Although exact sizes and shapes may vary, it will be approx. this general size. Personalization Personalization is included on the top of this ring box listing. We can custom create nearly any design or wording you would like that can fit on the top of this item; add the information to the receipt upon purchase and I'll create a custom engraving preview image for you to approve! Popular engravings: Marry Me? Heart surround with initials Say Yes! 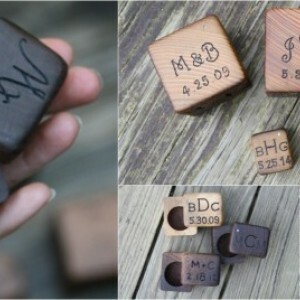 Monogram Initials with special date We can custom design nearly any personalization you would like that fits! To see a number of example engravings see our blog here: http://rusticcraftdesigns.com/engraving-examples/ (you'll have to cut & paste into your browser) Finishing and Care This wood ring box will be finished with our own original blend of beeswax+oil. SHIPPING Shipping rates are listed with the item, based on lowest cost shipping: USPS First Class Mail with delivery confirmation, which usually takes between 2-5 business days. r u s h s h i p p i n g See our shipping & policies tab for current turnaround times. Rush Processing & Express shipping options are available---contact us. l o c a l p i c k u p If you are local to the Central Massachusetts area and wish to pick up your items in person, contact us. i n t e r n a t i o n a l s h i p p i n g For international shipping costs, I am shipping USPS First Class® or Priority Mail® International. Import duties, taxes, and brokerage charges are not included in the item price or shipping cost. These charges are the buyer's responsibility. Please check with your country's customs office to determine what these additional costs will be prior to buying. 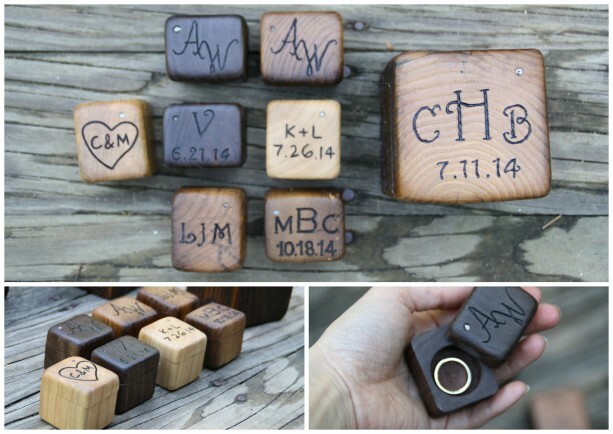 RING BOX REVIEWS: "Very professional! I liked the quick responses and the proofs to look at before the work was started! Received the ring boxes we ordered on time and they are perfect! " 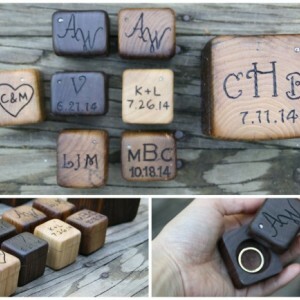 "The Mini Rustic Wood Ring Box was loved by everyone, including my fiance. The unique design especially the simple opening shocked my friends and family. The immaculate craftsmanship of the ring box, including the engraving, exceeded my expectations. I highly recommend purchasing this for your proposal. " "better than we could have imagined, thanks! " "My package just arrived - only days after I placed my initial order! I was truly impressed by the craftsmanship and care that was put into each box. These boxes will make perfect gifts for my nephews at my wedding. I highly recommend these artisans and their unique, quality work. " "Just received my box in the mail; looks great. So nice to have it personalised. Great attention to detail even in delivery (nicely wrapped up!) and great service from Sam at RusticCraft. My wife to be will love it! " "Seller was quick to respond, quick to send proof, received ring box quickly. We love this box, so cute, perfect for our wedding!! " "I love my box!! I cannot wait to use it for our wedding!! And it smells amazing! " "I love this for my little ring bearer! its different and so well made. It shipped on time and i loved that i got sent a proof prior to shipping. " "it turned out beautiful! thank you! " "I got 2 for each of our ring bearers, love them! The wood itself has a great look to it and will fit into our "earthy elegant" themed wedding beautifully!! " "I love it! The detail in the wood is beautiful! A perfect size- not too big, not too small- just PERFECT! Thank you! "